Are you the one who feel drowsy, lazy, not so good in winters? Then head towards these amazing beaches in India to let you feel rejuvenated, refreshed, and all good! These awesome beaches will make you feel fantastic with the lovely atmosphere they surround you with! The lovely and beautiful beaches in India portrays the beauty of blue skies, warm ocean waves, golden sandy beaches and tall palm trees picturizing the serene beaches in India. Undoubtedly they offer an unforgettable holiday during the winter season. When the chilly wind in the air spreads gloom, it’s best to pack your back and rush towards the sunny and bustling beaches. Extending over a coastline of 7517 km, India has some of the best beaches in the world with a mix of adventure and relaxation. These beaches have a tropical climate and the weather remains pleasant. As the winter is at its onset and you have already started missing summers. These beaches in India have a tropical climate and pleasant weather. As soon as the winter is on the start line and you are already in the mode of missing the summers. Here are 12 beautiful beaches in India to go this winter and return back to your summer spirit! Radhanagar beach, commonly known as Beach No 7 is blessed with immense natural beauty and serenity. Regarded as one of the best beaches in India for a honeymoon, this beach has been awarded as ‘Asia’s best beach’ by Time Magazine in 2004. The blue turquoise water, the clean and attracts the honeymooners from all around the world. Simply sit back and relax by the beachside or pour yourself in adventure activities. This 2 km long beach is truly one of the best beaches of Andaman Islands. Have the adventure of exciting activities like snorkeling, scuba diving, and kayaking. Just glance at the beautiful sunset views. Bask in the glory of the sun. The beach is 12 km from Havelock’s boat area. Nearby Attractions: Blue Corals Dive, Dive India, Venom Bar, Kalapathar Beach. How To Reach: The beach can be reached via a seaplane and there are two government boats also that connect Havelock Island to Port Blair. If you love the beaches of Goa, but the tourist crowd seems to be little bothering, then head towards the beautiful Agonda beach, positioned in the southern Canacona Taluka of Goa. A comfortable and tranquil beach, ideal for honeymooners and isolation-seekers. This beach is also known as the nesting place for Ridley Turtle. The Agonda beach is all about relaxed atmosphere, untouched natural beauty, azure waters, and soft white sand. Just rent a bike, drive from Palolem towards Panaji, and Agonda beach welcomes you! Nearby Attractions: Cola Beach, Fluidsymmetry, Galjibaga Beach, Goa Jungle Adventure, Samson’s Kiosk, Animal Shelter Agonda, AUGUSTIN Studio & Gallery, Daddu’s Healing Center, Palolem Beach, Butterfly Beach, Mobor Beach, Conco Island, Cavelossim Beach. Rail: Marago, on the Konkan Railway and local railway station Canacona (also known as Chaudi). Canacona is20 minutes away from Agonda Beach which cost around Rs 300 in the autorickshaw and Marago is at 30 minutes distance and cost around Rs 800 in a taxi. Varkala Beach in Kerala is rested at the bottom of splendid cliffs, the beautiful beach is just one hour in the north side of Trivandrum. The beach lies amidst Alleppey and Kovalam. 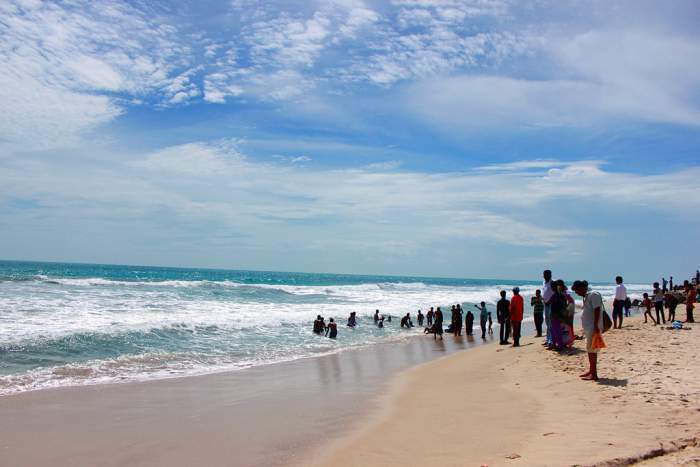 The awesome beach is also known as Papanasam beach, ideal for swimming and sunbathing and offers wonderful sunset views. The stream near the beach is considered as therapeutic and medicinal properties. A less-commercialized beach is adorned with the immense natural scenery. The big red rocks and coconut trees look beautiful. Do not forget to click photographs for souvenirs. Just take a dip in the waters and feel relaxed. A 900-year-old Janardana Swami temple is another must-visit attraction here. Nearby Attractions: Varkala Cliff, Can Fly Adventure, Agnihotra Yoga Retreat, Janardhana Swami Temple, Royal Art Gallery, Vishnu Temple, Varkala Aquarium. How To Reach: Situated in the Southern part of Kerala, the beach is easily reachable by road and is a landmark in itself. Best Time To Visit: Nov-FebThe place is just about 50 kilometers from Trivandrum, it is easily accessed by buses or cabs once we reach Trivandrum. The closest airport to Varkala is the Trivandrum International Airport The nearest railway station is in Varkala itself, at a distance of about 5 kilometers from the beach. Morjim is one of the best beaches in Goa, this beach in North Goa lies amid lush locales, offering a refreshing sight. 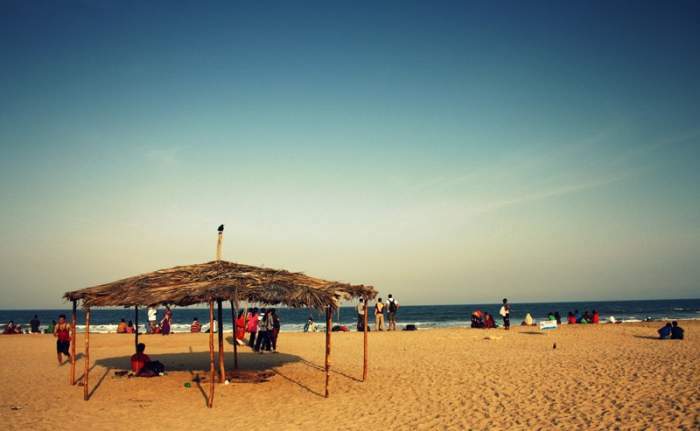 The beach is less-commercialized in comparison to Baga, Colva, Calangute etc. and thus is ideal for those who love aloofness. The beach is also famous for being the home of Olive Ridley turtles. Morjim is also locally called ‘Little Russia’, the reason is due to the presence of Russian emigrants here. Morjim is a wide-open beach like Mandrem and Ashvem, wherein all the three are placed adjacently in North Goa. There is no scarcity of trendy beach shacks, resorts and beach hut here at the beach. Nearby Attractions: Terra Conscious, Chapora Beach, Vagator Beach, Chapora Fort, Ozran Beach, Mandrem Beach, Ashwem Beach, St. Cajetan’s Church, Keri Beach. How To Reach: Dabolim Airport is about an hour and a half drive away. Panaji is an hour away. And you can hire a cab to reach here. Stretched at a distance of 8 km from Gokarna, Om Beach acquired its name from semi-circular inlets that join together, forming an inverted symbol of Om (Hindu religious symbol). It’s one of the best beaches in India. 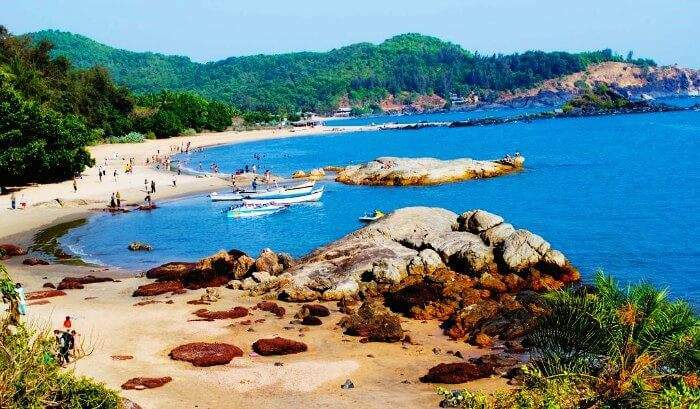 Being one of the famous beaches in Gokarna, Om beach attracts locals as well as tourists, alike. Just enjoy a little lazy walk on the white sand of the beach and find yourself relaxing amid tranquility. Om Beach also offers to indulge yourself into numerous water sports activities like banana boat rides, surfing, parasailing, and water-skiing. Enjoy the thrilling adrenaline rush. People may also enjoy visiting Kudle beach, located nearby. Nearby Attractions: Kudle Beach, Half Moon Beach, Paradise Beach, Mirjan Fort, Maha Ganpati Temple, Koti Tirtha, Nirvana Beach, Bhadrakali Temple, Baada Beach, Shiva Cave, Namaste Café, Mahalasa Temple, Uppin Ganpati Temple, Lalguli Falls. How To Reach: At a distance of few kilometres from the bus stand, Om Beach in Gokarna is located. One can either prefer walking or hire an auto for the short ride. 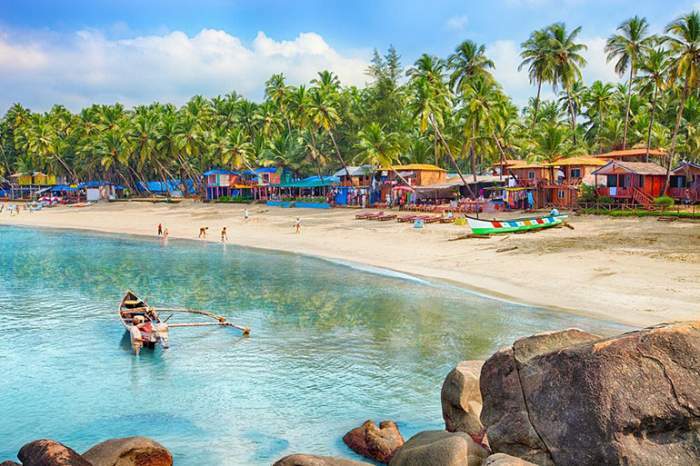 Located in South Goa, wrapped in the shades of a thick forest of coconut palms, Palolem beach is a crescent-shaped beach, perfect for peaceful vacations. Dolphin-spotting tours in Palolem are very much popular. Coming to the northern end of the beach – it’s quite full-house in comparison to its southern end. If you love swimming, then this place is for you. Arguably the most beautiful beach of the state, Palolem is punctuated with fist nets, boats, beach huts, and variety of flora. Aside from dolphin spotting at Palolem, enjoy other activities such as boat riding, and shopping and relax by getting a massage done. 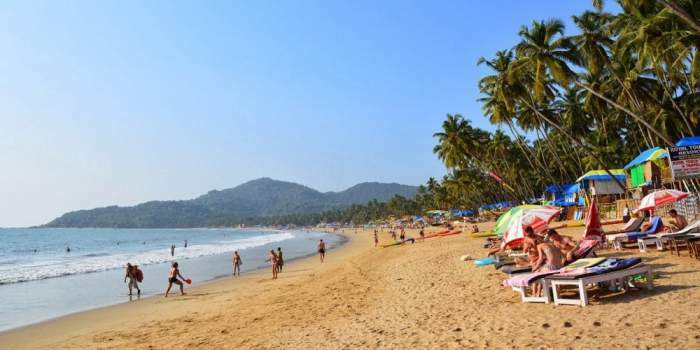 Nearby Attractions: Palolem Island Reserve, Butterfly Beach, Saint Tereza Of Jesus, Pantem beach, Shree Dutta Guru Mandir, Pantem – Colomb beach, Pandava’s Drum, Bumipurush Temple. Located at a distance of 35 km from Chaudi or Canacona. From Margao, Panjim or Chaudi, several buses head towards Karwar which will drop you at the Polem bus stop. Also, within a time of 15 minutes, you can walk down the road through the paddy fields will make you reach the beach. One of the must-visit beaches near Rameshwaram, Dhanushkodi beach is bordered by the Indian Ocean on one side and the Bay of Bengal on the other. At a distance of 20 km from Rameshwaram, this beach offers magnificent views of the turquoise blue sea waters along with pristine white sand. It is believed to be the place where Lord Rama with Lord Hanuman and his army build the ‘Setu’ bridge to reach Lanka for Mata Sita. Have a walk and enjoy the peace at this beautiful beach. Nearby Attractions: Jatayu Tirtham Temple, Ruined Temple/Church of Dhanushkodi, Arulmigu Ramanatha Swamy Temple, Rama Tirtham (Gandamadana), Pamban bridge, Annai Indira Gandhi Road Bridge, Hanuman Temple, Kalam National Memorial. 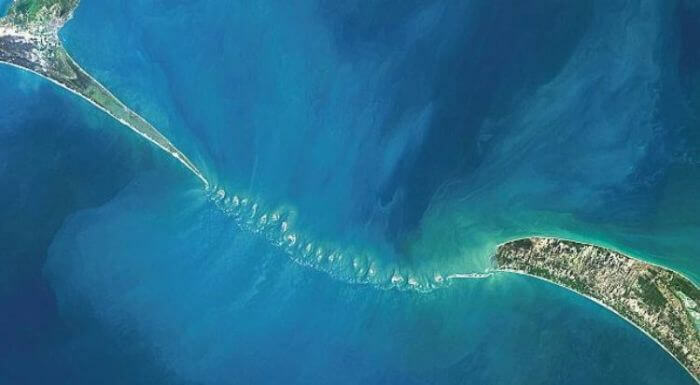 How To Reach: The place is situated at a distance of about 15 km from Rameshwaram. Jeeps and trucks from Pamban have daily services to Danushkodi. You can also take a personal Jeep in case you don’t want to travel by shared tempos. 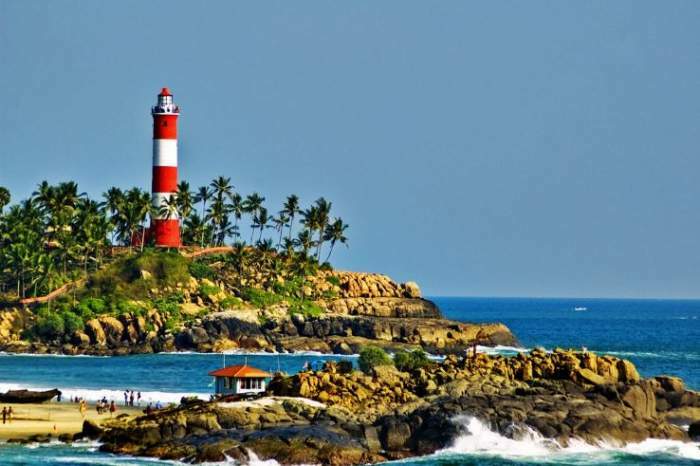 Kovalam beach is a crescent-shaped beach that is a connection of three beaches, one of which is the beautiful lighthouse beach, along with Samudra and Hawa or Eve’s beaches. Named after the 30 m high lighthouse situated on the top of the Kurumkel Hill, it’s one of the best beaches in Kerala, which grabs the attention of tourists from all around. Enjoy a leisure walk here on the silver sand and let your feet feel the calm waves touch. Lighthouse beach is the most occupied and the most popular one amongst the three. The sunset views nothing short of memorable. Do not miss the delicious finger-licking local delicacies at the eateries placed nearby. Swimming, surfing, parasailing, and paragliding are some of the fun activities you will love to explore here. Nearby Attractions: Kovalam Beach, Hawa Beach, Vizhinjam Lighthouse, Kollam Beach, Kovalam Surf Club, Samudra Beach, Vellayani Lake, Sea Side Orchid Farm, Attukal Bhagavathy Temple, Aazhimala Siva Temple. How To Reach: The beach is situated in Kovalam and is well-connected by road network. One of the most popular attractions in Orissa, Puri beach lies on the Bay of Bengal. The beach grabs the eyeballs of both leisure vacationers and pilgrims when they come to pay homage to Lord Jagannath which is regarded among the best holy places in India. Puri is one of the most admired Chardham destinations and has a lot of religious importance too. As you take a walk, enjoy the hustle-bustle around. 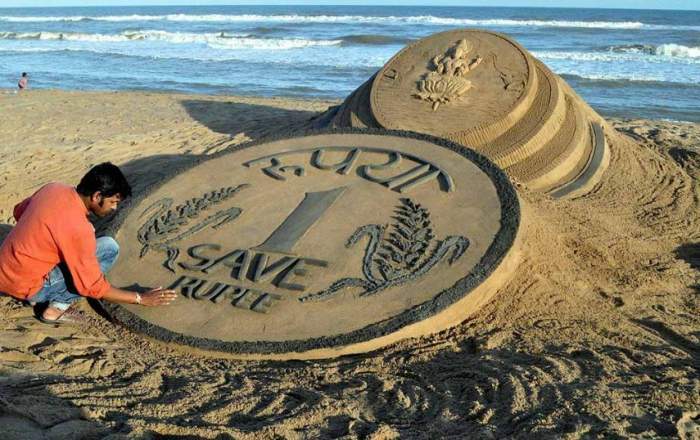 Sand art is another high spot that will surely make your day. Puri beach is 65 km from Bhubaneswar and 35 km from the Sun temple. The beach offers memorable sunset as well as sunrise views and doesn’t forget to capture these lovely moments in your camera. Enjoy visiting the nearby fishing village and interact with the locals. In November, the annual Beach Festival takes place, attracting domestic and foreign nationals in good numbers. Nearby Attractions: Puri Beach, Jagannath Temple, Konark Beach, Swargadwar Beach, Chilika Lake, Chilika Wildlife Sanctuary, Daring Badi, Puri Light House, Sakshigopal Temple. How To Reach: Situated 2 Kilometers away from Puri railway station, the beach can be accessed by the available means of transport. One of the most beautiful beaches in India, Paradise beach is located at spans of 8 km from the main town, along the Cuddalore Main Road. This is a clean beach with a pure vibe, offering a refreshing experience. The beach is famous for the presence of dolphins. With the help of a ferry. traverse through the backwaters to arrive at the beach. Also known as Chunnambar, it’s the perfect beach to enjoy picnicking. The boathouse is one of the important and best attractions here. Enjoy the exciting rides here such as bouncing castle and merry-go-round by paying a minimal entry fee. Boating facility is also offered here. There is no provision of accommodation here. Nearby Attractions: Storytrails Pondicherry, The Pelican Playhouse, Kallialay Surf School, Varadaraja Perumal Temple, Arulmigu Manakula Vinayagar Temple, The Basilica of the Sacred Heart of Jesus, ISKCON Pondicherry, Seaside Promenade, Rock Beach, Bharati Government Park. Timings: All days from 9:00 am to 6:00 pm except on Sunday the closing time is 3:30 pm. Travel Tip: Remember the timings of the last ferries as you will need to return from the beach before the sunset. 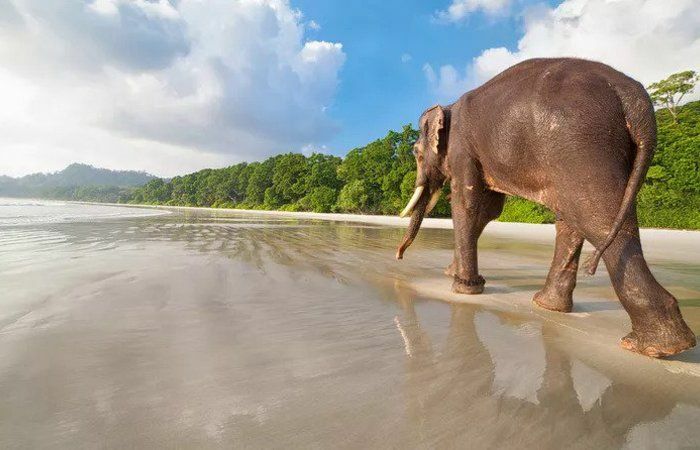 Elephant beach in Havelock Island is no less than a paradise because of its immense natural beauty and also acknowledged as one of the best beaches to visit in India. Indulge in wonderful activities like sea bathing, sun basking and beach walking. For adventure seekers, there’s a thrilling water sport like snorkeling. Wait for No one! Dive deep into the sea and give your eyes a treat to watch the beauty of the coral reefs. If you are with your family, visit the beach, simply relax or enjoy a picnic lunch at the Elephant beach. This white sandy amazement with azure waters is approximately 20 minutes by boat from the island dock. How To Reach: To reach Havelock Island, one can choose multiple ferries and cruises available from Port Blair and jetties are also available at the island to travel to nearby beaches. Using a short trek, you have to reach the beach or there are also boats present there to reach Elephant Beach. Also, you can prefer cycling towards the beach having the trail from Havelock and by the mid-way, you can stop at Radhanagar Beach and finish your trip at the Elephant Beach. Occupying its spot near Alleppey (about 11 km away), Marari Beach has got blessings by soft golden sands and an amazing atmosphere, making it ideal for a perfect holiday destination and a memorable one. Known as one of the most romantic beaches in India, Marari offers various activities like deep sea fishing, sea surfing, parasailing, and water skiing. 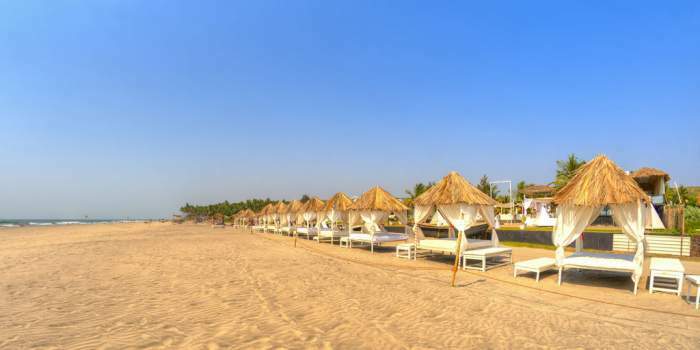 The beach receives its name from Mararikulam, a fishing village on the Arabian Sea coast. Isolation here attracts peace-seekers along with honeymooners to the beach. 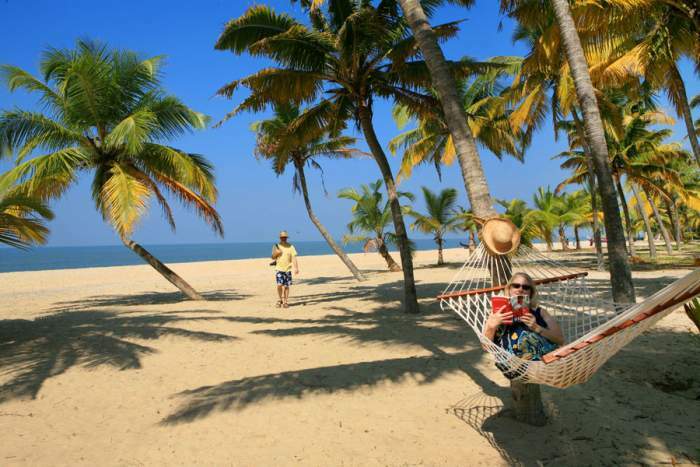 The beach is a memorable experience after the backwater of Alleppey, far from the city’s bustle. Spend some memorable moments with loved ones here. Nearby Attractions: Kumarakom Bird Sanctuary, Kerala backwater canals, Mararikulam Shiva Temple, Thumpolly Beach, Kokkamangalam Apostle St. Thomas Pilgrim Centre, Alappuzha, Chinese Fishing Net. How To Reach: The beach can be reached by any public or personal transportation. Situated 40 km from Chennai on the coast of the Coromandel, Covelong Beach is famous for its beach activities and the undisturbed and calm beauty around it. Once, it was a big harbor, now you will find the beach on the way to Mahabalipuram. It’s one of the beautiful beaches in India. Covelong Beach is always busy with water sports activities like windsurfing and swimming. Ancient monuments like forts, churches, and mosques are the center of attraction apart from the town of Mahabalipuram. The Crocodile farm in Covelong Beach is a well-recognized destination for a joyous outing in the daytime. Nearby Attractions: Shirdi Sai Baba Temple, VGP Snow Kingdom, ISKCON Chennai, Sri Sri Radha Krishna Temple, Nitya Kalyana Perumal Temple, Muttukadu Lake, Tiger Cave, Madhya Kailash Temple, Thiruporur Murugan Temple, Monkey Monk B2B Chillthirll Zone in Chennai, Click Art Museum, Live Art Museum. How To Reach: The beach has convenient access to (OMR) Old Mahabalipuram Road and (ECR) East Coast Road from Chennai. (CMTC) Chennai Metropolitan Transport Corporation and TNSTC Villupuram has frequent bus services linked with almost all areas in Covelong and Chennai City. Other than this, the Covelong beach can be reached by boat too, along with the seashore of Chengalpattu. Also Read: 21 Amazing Places To Be Thrilled Of In Chennai! Winter is here! So is the list of the most happening places this season!